Climate talks have begun in Durban, South Africa, and expectations for a global solution have never been lower. This leaves more delegates preparing for a multilateral future where several clusters of international arrangements could replacing the Kyoto Protocol. Here’s an overview of the situation to-date. 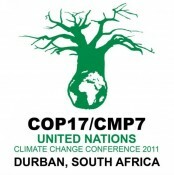 28 November 2011 | DURBAN | South Africa | The 17th session of the Conference of the Parties (COP 17) to the United Nations Framework Convention on Climate Change (UNFCCC) has begun, and expectations have never been lower, while the stakes have never been higher. The first commitment period of the Kyoto Protocol is set to expire at the end of 2012, and these are the talks that were supposed to tell us what comes after. We’ll be bringing you daily coverage of negotiations and side events beginning tomorrow and running through September 9. Today, we’ll look back at the events that brought us here. Last year’s talks, COP 16, took place in Cancíºn, Mexico, and ended with a last-minute agreement on the need to move forward with mechanisms aimed at slowing climate change by saving endangered rainforests and reducing emissions from deforestation and degradation (REDD). That agreement set in motion a series of meetings that brought us to where we are today. The UNFCCC has held three technical meetings between COP 16 and now. The first took place in Bangkok in April, the second in Bonn in June, and the final meeting in Panama in October. For a detailed but very technical analysis of the proceedings and outcomes of these meetings, see the work from the International Institute for Sustainable Development (IISD). Those meetings yielded little in terms of solid agreements on technical or policy issues, and meetings often felt like a perpetual kicking-the-can-down-the-road game, creating a more robust agenda for upcoming meetings but resolving little in terms of the important questions that still remain. The Durban talks – like all talks since COP 13 in Bali, Indonesia – follow the “Bali Action Plan”, which essentially means two negotiating tracks. The first track, the Ad Hoc Working Group on Further Commitments for Annex I Parties under the Kyoto Protocol (AWG-KP) is focused on future commitments for developed countries under the Kyoto Protocol. For our purposes, the most important track within the AWG-KP is the one focused on land-use, land-use change and forestry (LULUCF) in so-called “Annex 1” countries, which are essentially developed countries that joined the Kyoto Protocol. Under the protocol, Annex 1 Countries can write off improvements in emissions from land use against their industrial emissions. All countries are obligated to account for their emissions from forestry, which means that tree-planting activities (afforestation/reforestation) count towards emission targets, while deforestation activities count against them. The contentious part is what happens with other activities. In this commitment period, countries have been free to pick and choose which additional activities they account for under LULUCF. These activities include forest management, cropland management, grazing land management and revegetation; and countries have essentially been free to account for the activities that work in their favor and ignore the others. At COP17, parties will likely debate this voluntary approach to LULUCF-related activities accounting. They will also decide how much LULUCF will contribute toward Annex-I parties’ emissions targets going forward. At COP 16 in Cancun last year, negotiators agreed that each Annex I Party would submit information on the forest management reference level to the secretariat. Those levels would inform commitments going into a second Kyoto commitment phase and will likely have an impact on establishing baselines for LULUCF, and would consider applying a cap to the amount of emissions reductions that could come from managed forests in Annex-I nations– a topic that is sure to be debated at this year’s talks given that countries a loathe to give up cost-effective tools to meet emissions targets. The second track is the Ad hoc Working Group on Long-term Cooperative Action (AWG-LCA), and it’s intended to achieve agreement on those issues not covered by the Kyoto Protocol. This is where negotiations are taking place that are aimed at reducing emissions from deforestation and degradation (REDD) in the developing world. REDD and REDD+ involve payments from industrial emitters in the developed world to forest people in the developing world. These payments are aimed at saving endangered rainforests and supporting other activities that promote sustainable forest management – thereby reducing greenhouse gas emissions from deforestation and forest degradation. These negotiations will determine the degree to which Annex I countries are able to use that type of activity to meet future emissions targets (if at all). Brazil, South Africa, India and China, collectively known as the BASIC Countries, rallied around the call for “common but differentiated responsibilities” which would allow them to pursue an “equitable space for development”. These phrases are code for emission targets lower than developed countries such as the US and Germany. That point is also an incentive for BASIC nations to advocate for the rollout of so-called “nationally appropriate mitigation actions” (NAMAs), which would provide flexibility in achieving those targets and allow them to avoid the emission caps that developed countries face. They have acted as a bloc in the past, and will very likely continue to do so. At their most recent summit in Brazil, they called for an extension of the Kyoto Protocol, but without mandatory commitments for themselves and the other non-Annex I parties. The European Union is committed to extending the Kyoto protocol, and has been indicating that it will honor its commitments regardless of a formal extension. However, with the recent economic troubles facing the EU bloc, that commitment may waver. The EU ETS has, since its inception, been wary of offsets from forest carbon projects, and will apparently continue to disallow those credits, including REDD+, into phase III of the EU ETS, regardless of their treatment under the Kyoto protocol. Other Annex-I nations Japan, Russia, and Canada have stated that they will vote not to extend the Kyoto protocol. Japan has been pursuing a bilateral approach that would function alongside the CDM and will act during the negotiations with those plans in mind, possibly only voting for a successor to Kyoto that will leave room for their planned bilateral mechanism to function. The United States, which signed but never ratified the Kyoto Protocol, says it won’t do so this time around, either. The main sticking point for this administration seems to be that China and India (along with other developing nations) are unwilling to take on the same targets as countries like the US, whose emissions have historically been much higher than developing China and India. The US seems firmly committed to a “pledge and review” system in which nations would make a pledge to reduce emissions by a certain amount and employ UNFCCC mechanisms to achieve those pledges. The pledges would then be reviewed by the UNFCCC. The Green Climate Fund Over the past year parties have agreed to a long-term finance commitment of $100 billion by 2020 to support climate change mitigation and adaptation activities in developing countries, but without a concrete agreement on how those pledges will be captured and delivered. The Green Climate Fund is set to take on that role, so discussions at Durban will focus on the structure and governance of the Fund. They will also to try figure out where the $100 billion will come from. The usual suspects – public, private, bilateral multilateral, as well as alternative sources of finance – are on the table. NAMAs Expect to see a lot of discussion around Nationally Appropriate Mitigation Actions – emissions reduction and sustainable development programmes established at the national level. NAMAs are seen as a way to continue to make headways in emissions reductions through a wide range of project types, potentially including forest carbon projects, without a global agreement. They would be voluntary in nature and would be distinct from the emission reduction commitments of developed nations. The basic definition of NAMAs has been agreed upon. Now negotiators will discuss the creation of a global registry, issues of funding (market-based, public funding, or some combination of the two), and sorting out MRV. If NAMAs are financed under a market mechanism, expect it to utilize much of the CDM architecture. (Post-)Kyoto Protocol Developing countries and the EU have called for a second commitment phase of the Kyoto protocol, but with certain caveats. Developing countries are likely to only agree to an second commitment phase if the idea of “common but differentiated responsibilities and respective capabilities” is reaffirmed, affording them laxer commitments than developed nations. The EU, who are set to start phase III emissions trading scheme regardless of a continuation of the Protocol, are supportive of a new round of legally–binding Kyoto targets, but only as part of a global, comprehensive framework – an unlikely scenario given the opposition of countries like Japan, Russia, and the U.S.A. The U.S.A. may support legally binding commitments under a second phase of Kyoto, but only if it applies equally across all major emitters (something countries like China are sure to reject). See here “> for a good analysis of possible post-Kyoto agreement scenarios. REDD Now that REDD has established itself as an attractive mechanism for developed and developing countries alike, discussions in Durban will focus on ironing out technical kinks, such as the implementation of safeguards and how financing for REDD will occur (and whether it will be brought under the CDM). Issues around reference levels are likely to be the main sticking point, as the “common but differentiated responsibilities and respective capabilities” will make for arguments on targets and reference levels between developed and developing nations. Even without an international agreement, REDD+ is sure to keep trotting along under the guidance of the UN-REDD Programme, the Forest Carbon Partnership Facility , and the REDD+ Partnership , as REDD readiness activities continue. Daniel Kandy is a research fellow at Ecosystem Marketplace, focusing on Forest Carbon and Biodiversity markets. He recently graduated from Washington University in St. Louis with a degree in anthropology, focusing on land use and agriculture. He can be reached at dkandy@ecosystemmarketplace.com.